The first annual ‘Serve Seattle’ campaign by Bethany Community Church (BCC) was held Saturday June 4th. With church members coming together, impact to the Seattle area is widespread. Satellite churches of BCC are represented in Meadowbrook (NE Seattle) at Nathan Hale H.S. 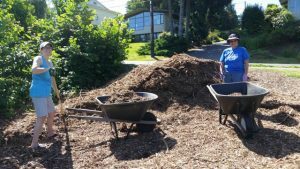 Other communities such as Greenlake, Lynnwood and the Eastside also participated in the day of service. 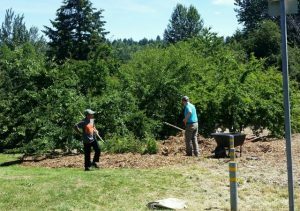 NE Seattle BCC has also been a partner with M2’s Lake City Holiday Project. 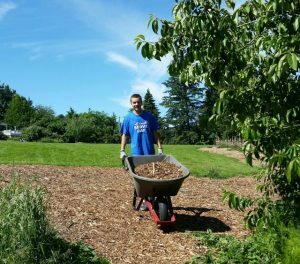 As a supportive community member, the ‘Serve Seattle’ day team worked in two different areas of the Orchard. 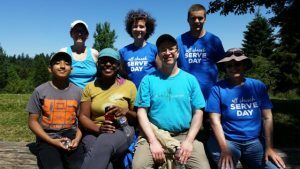 The East Orchard and North Orchard trail area both benefited from the service day. This is the second volunteer effort by the community. With very hot temperatures, the group started early and accomplished quite a bit. 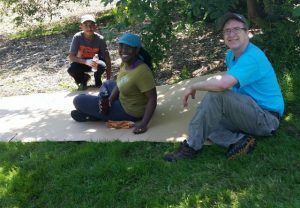 With six different designated Orchard sites at MCGO, it’s great to have such conscientious groups like NE Seattle BCC to further the goal of urban gardening and learning sites. We appreciate the partnership and look for more fun time together, learning and growing. West N.O. 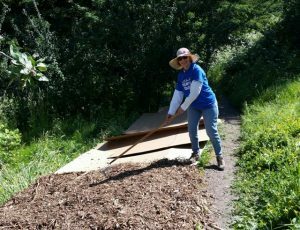 side of trail mulched, improving soil and creating better access.